Identify emerging trends in drug therapy and their place in patient care practices. State BP goals for patients under age 60, age 60 and over, and those with diabetes or chronic kidney disease according to the JNC 8 hypertension guidelines. 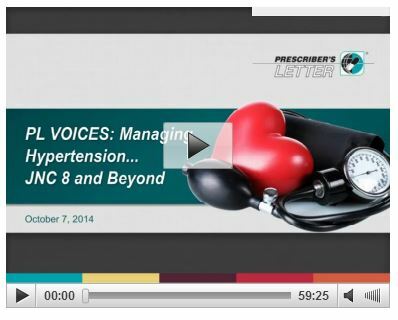 Name one area of controversy in the new JNC 8 hypertension guidelines. Select appropriate BP lowering therapy for three typical hypertensive patients. Get the Webinar and Slide Deck!